Bathrooms are areas in our homes that need cleaning on a regular basis. Bathrooms harbour bacteria, soap scum, hard water stains and sometimes stink. Bathrooms are small enclosed areas, so the cleaners we spray onto the surfaces in our bathrooms also get inhaled into our lungs. Want a new way to tackle your bathroom? The first time I ever really thought about bathroom cleaners, was when I was pregnant with our first child, and my husband offered to clean the shower! He didn’t want me inhaling the strong fumes while in the enclosed space of our shower stall. I realize now that if you should avoid something because you are pregnant, you should ALWAYS avoid it. No one should be inhaling chemicals when cleaning their home. Bathrooms require a ‘heavy duty’ clean but with Norwex you won’t compromise your health or your environment to do it. 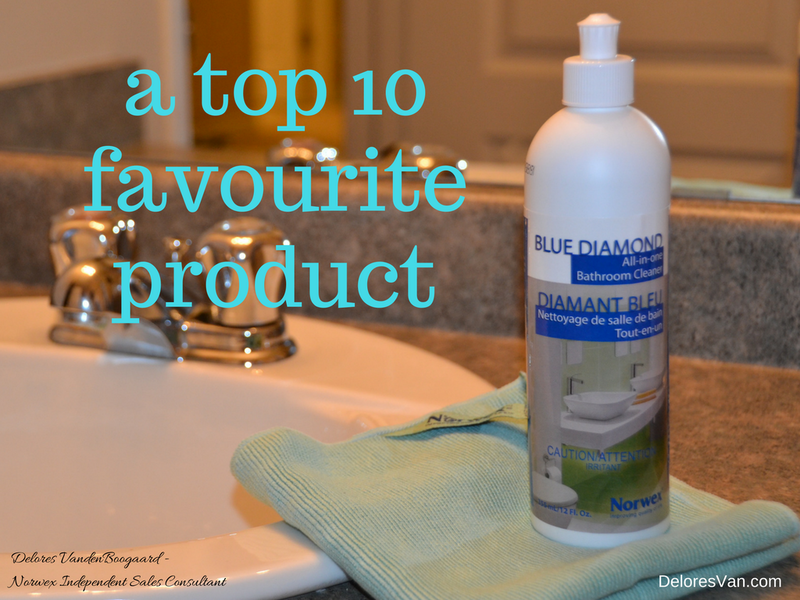 The Blue Diamond All-in-One Bathroom Cleaner is one the Top 10 favourite products. 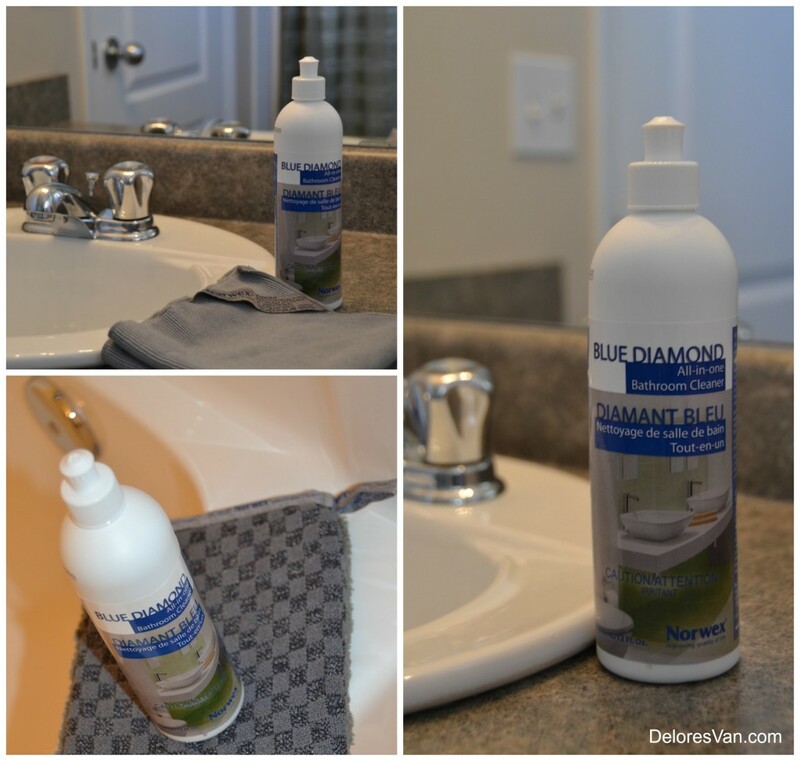 Like its name suggests, Blue Diamond is designed to replace dozens of traditional bathroom cleaners without harsh chemicals but still delivering deep clean to all surfaces, eliminating odor-causing bacteria and germs, plus removing rust stains, water stains & soap scum. Your bathroom will shine in no time! Blue Diamond is a thick, highly-concentrated formula, phosphate-free, alkyl phenol ethoxylates-free, and fragrance-free. It contains organic salts and citric acids to replace strong corrosive acids and is readily biodegradable — even the container is recyclable!!!! The fact that this gel product is scent free, is huge!! I have a number of house cleaners who exclusively use this product. Two ladies shared with me that the product they previously used — which are common store bought cleaners — gave them bleeding noses from the constant exposure. Many of us dislike cleaning one or two showers…these ladies clean that many and more each day! Since switching to Norwex, they no longer have this issue. Over 13 years ago, I vividly recall pulling the edge of my shirt over my nose, to avoid inhaling the fumes. You can clean all the surfaces in your bathroom with this product. It is both a cleaning agent and a descaling agent in one with the ability to cling to all surfaces. TOILET: Squirt a thin stream in your toilet, work around the toilet with the Ergonomic Toilet Brush, let sit for 5 minutes and flush. SINKS, SHOWERS & TUBS: Pre-wet surface. Apply a light stream on surface and immediately spread with EnviroCloth or Bathroom Scrub Mitt, rinse immediately. PORCELAIN: Dilute 1 part Cleaner : 7 parts Water. Apply a light stream on surface and immediately spread with EnviroCloth or Bathroom Scrub Mitt, rinse immediately. NATURAL STONE SURFACES: Do not use. I am often asked, what is the difference between the Blue Diamond and the Descaler? There are two kinds of housekeepers and Norwex has the solution for them both!! 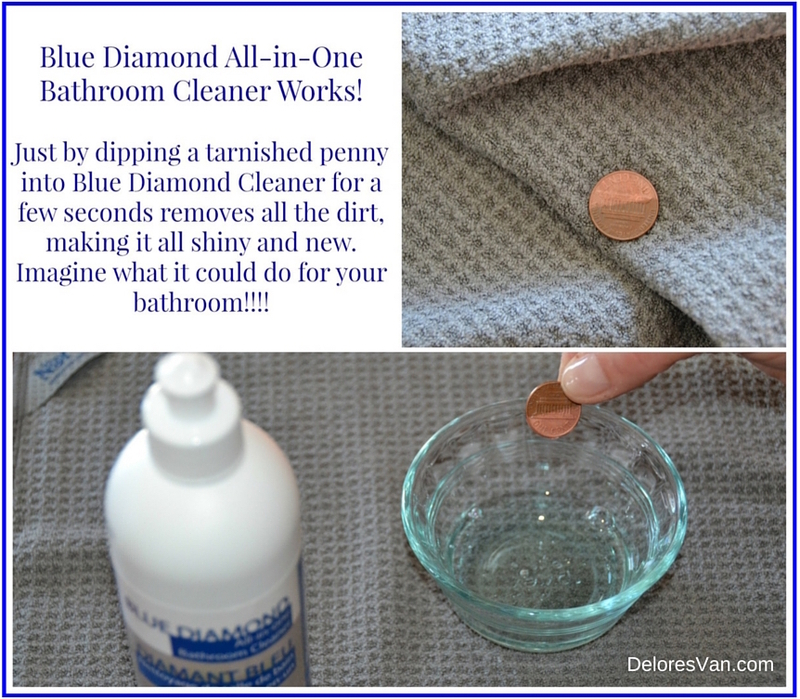 Those who clean their home weekly…use the Blue Diamond. Gel product, you can dilute. Spray product, you never dilute. So next time you (or your hubby) tackle the enclosed areas of your bathroom, breath confidently. Come armed with an EnviroCloth or a Bathroom Scrub Mitt and this amazing Blue Diamond Cleaner to make your bathroom shine!!! 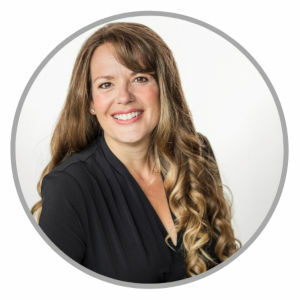 What is Norwex? Is Norwex new to you? Or are you wondering what Norwex product would be great to add to your collection? Look no further. 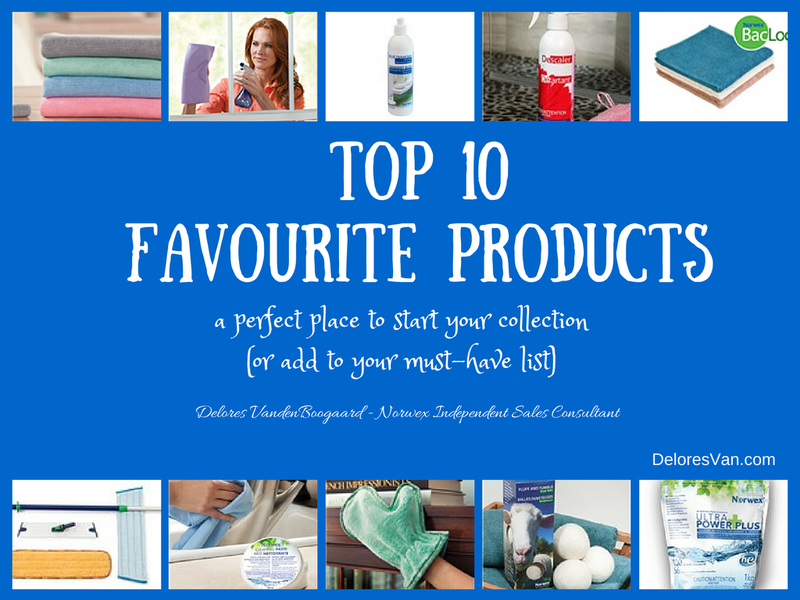 Let me share the top 10 favourite Norwex products that will get you well on your way to transforming your home into a safe haven. These are the products I sell the most, they are tried-and-true, and have become the cleaning staples in my home for the past 10 years. EnviroCloth — It is the cloth that started Norwex and has the ability to remove up to 99% of bacteria from surface when your following proper care and use instructions. They are simple to use and simply clean your home with just water. Window Cloth— A Norwex staple that used along side the EnviroCloth to polish surfaces and windows. Use the Window Cloth dry to polish the surface after wiping with a wet EnviroCloth, or mist your windows or mirror with water and polish to a streak-free shine! Blue Diamond All-in-One Bathroom Cleaner — This highly concentrated cleaner is perfect for all your bathroom cleaning needs. It has both cleaning and descaling properties without corrosive fumes to remove hard water deposits, soap scum, rust spots and leaving all the surfaces in your bathroom shiny. ** do not use on natural stone. Descaler — This Descaler consists of natural acids to effectively remove mineral deposits, soap scum, lime/scale, calcium and rust stains without damaging the surfaces with scrubbing. It makes your taps & drains, your shower doors & curtains, shower stalls & bathtubs all SHINY. Spray Descaler on the desired surface, wait 5 minutes and wipe with an EnviroCloth or Bathroom Mitt to reveal a perfectly clean surface. TIP: Put a little Descaler in a plastic bag and attach it onto your shower head with an elastic band…come back a couple hours later to sparkling clean spray nozzle! ** do not use on natural stone. 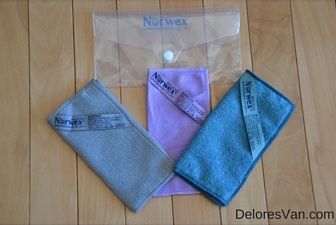 Vintage Body Pack — This 3-pack, super-soft, Norwex Microfiber Cloth pack is perfect for cleansing your face and body gently, yet thoroughly. It is perfect for sensitive or mature skin and works to cleanse skin and remove excess oils, exfoliate acne and blackheads with just water. Superior Mop Collection — The versatile mop system comes with both the dry mop pad and the wet mop pad for a complete floor cleaning system. The dry mop uses static electricity to attract the smallest particles as you first go over your floor in a figure eight pattern. Then quickly clean out the dry mop pad with a few strokes of the RubberBrush into the garbage. Grab the wet mop pad (which has self-purifying qualities of BacLock™ technology), rinse with warm water, roll to wring it out and then clean your floor without any chemicals. The mop is designed for linoleum, vinyl, laminate, wood, marble & tile flooring and will leave each surface streak free. Cleaning Paste — Affectionately known as “elbow grease in a jar”. This product’s active ingredients include: marble flour, natural soup & coconut oil. Use it with a Spirisponge or EnviroCloth to clean and polish chrome, stainless steel, porcelain, burnt on food, rust stains, coffee pots, glasses, food-ware products, bathtubs and tiles and lawn furniture. It is fantastic! *not for use on brushed stainless steel. Dusting Mitt — Can be used wet or dry to effectively and quickly dust all areas of your home, without any chemicals, including; blinds, screens, fans and vent covers. The Dusting Mitt uses static electricity to trap dust and allergens in the mitt. It has Baclock™ in the cloth goes to work to self-purify and inhibit odors from bacteria, mold and mildew growth in the mitt. For dirter jobs, spray a mist of water on the mitt and wipe down the surface. Fluff & Tumble Dryer Balls — These 100% natural wool dryer balls are a fantastic alternative to using chemical-laden dryer sheets to reduce the static in your clothes, reduce your drying time and you can add the beautiful scent of essential oils to the Dryer Ball to freshen your clothes. Ultra Power Plus Laundry Detergent — An awesome detergent that is highly concentrated, stain-fighter, safe for all linens, colour safe, safe for both HE and conventional washing machines, free from phosphates, filler, perfumes and is 100% biodegradable. What more could you want in a clothes detergent? Give one or all ten of these top 10 favourite products a try. Post below, how many of these products do you own? Let me know how they have made your home a safer haven. I am so excited about the New Norwex Products for 2016! This year Norwex has made some of it’s favourite products even better… more versatile and more environmentally friendly. Take a moment to see what is new and if it could better your Norwex collection. It is a 3-pack of the most favourite Norwex cloths in a compact size (16 x 16 cm), including; the famous EnviroCloth, Window Cloth & Body Cloth. They are small which makes them a perfect size to introduce a new friend or to just always have the right cloth right in your bag. 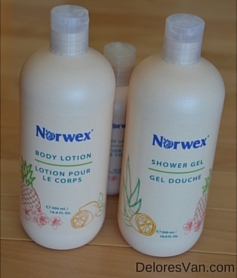 Norwex’s fantastic Body Lotion & Shower Gel are now available in a larger family size (500 ml)! Nothing smells better than these AMAZING products! The Shower Gel is a gentle foaming cleanser for your skin, made from the derivatives of fruit sugar, sweet pineapple, coconut & lemon; complete with aloe vera to moisturize and nourish your skin. This product is proudly organic and certified by both BDIH & Natrue. It is still available in the original convenient 200 ml size. The Organic Body Lotion is a perfect match for the Shower Gel and is made from natural botanicals including coconut oil, grape seed oil, aloe vera, sweet almond oil, shea butter and vitamin E. This lotion will leave your skin feeling wonderful and is certified organic from both BDIH & Natrue. It is also still available in the original convenient 200 ml size. The Ergonomic Toilet Brush & Holder was improved to include an antibacterial agent to inhibit the growth of bacteria and mold, keeping the toilet brush clean (not to mention ergonomic to reach all those little spaces)… Isn’t that smart? 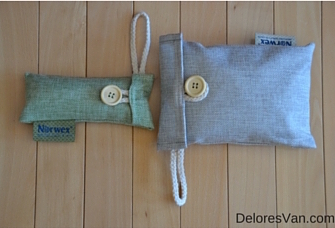 These Air Freshener Bags add long-lasting freshness to the needed areas in your home… without chemicals! Bamboo, which is fast growing and sustainable, is the secret ingredient… it is turned to charcoal and is able to absorb odours, mold or mildew-causing moisture. During the day time, it naturally recharges. They last for 2 years and then can be used as a natural fertilizer. The improved part is that you can replace the charcoal insert… making it an even more sustainable product! They are available in 2 convenient sizes. Let me know if you have any products you would like to see Norwex create and distribute. These products are proof that Norwex continues to create solutions to make homes safe havens. New Cleaning Solutions: Keeping it fun! Norwex has 3 fabulous NEW bathroom products! The first new product is the Pet to Dry — a silly name for the most fun hand towel ever invented. It was created for all the little kids in your life who avoid taking the time to wash their little hands, never mind, dry their little hands. “How do they do it?” you ask. They made the Pet to Dry irresistible!!! They are adorable & fluffy and all you have to do is pet it and your hands are dry. It comes in two styles – a pink pig & a yellow tiger. Like Norwex’s regular hand towels, these the Pet to Dry is made with BacLock™ technology works to self-purify the cloth and is constructed out of a soft chenille microfiber. It not only dries little hands quickly, but it is quick to dry as well. The best part of these soft, cute hand driers is, that it is an effective tool to help kids create healthy-hand-washing habits for the rest of their lives. Hang it on your washroom door knob or on the kitchen cabinets for quick and easy access! Do you feel like a contortionist when trying to clean and exfoliate the skin on your back? 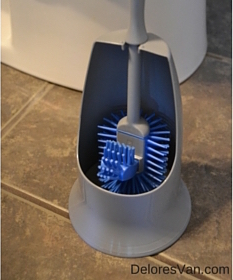 The second new bathroom product is the Back Scrubber! There is nothing better than a good back scratch… except for an exclusive Norwex BacLock™ technology, microfiber, dual handle & easy-to-grip, quick-drying Back Scrubber. Not only is a good back scrub a guiltless pleasure, but Norwex’s new product also aids in the health of your hard-to-reach skin with deep-cleaning exfoliation to remove toxins and impurities and reveal radiant, clean skin. Great for your neck, shoulders, legs and feet. Your back will thank you (and maybe your spouse too)! 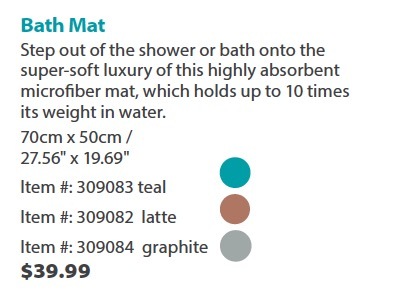 The third new bathroom product is the Bathroom Mat. Now it’s not completely new, but what is new is that it now comes in a graphite (grey) colour. It is still super absorbent, holding 10 times its weight in water, it still doesn’t slip on your bathroom floor because it is so thick, it still dries quickly and is super soft on your feet. It comes in three beautiful colours: teal, latte & graphite. Check out my previous post to get all the details on this fabulous bath mat & all its uses. These new bathroom products will help develop healthy habits and aid in healthier lifestyles without adding any toxins to your bathroom routine. Doesn’t that sound wonderful??? Do you have a swinging shower door that drips water on your bathroom floor? Do you walk around your washroom with wet feet after a shower? Do your kids vigorously splash in the tub, leaving the floor a wet mess? Do you have a hot tub or swimming pool in the backyard and people traipsing through your home with wet feet? Do you have a puppy that comes in with wet paws and coat? Does your toddler throw cups of water out of the bath or does your baby’s thunder thigh make BIG splashes? Do you have a busy shower with teenagers and the bathmat is always wet? Are you just tired to bending over to dry your own feet after a shower? Maybe you have a senior in your life that can’t reach their own toes? 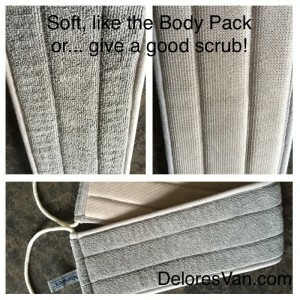 The Norwex Bath Mat is the solution! It holds 10 times its weight in moisture. That’s enough to catch drips off the door, dry many wet feet, absorb bath water spills, even dry the family pet. It is also absorbent enough to ensure that every family member’s feet are dry when they step off the mat. The moisture between your toes is even wicked up within seconds of stepping on the mat. To top it off, the Norwex Bath Mat dries faster than a regular bathmat. This Bath Mat is pure luxury! 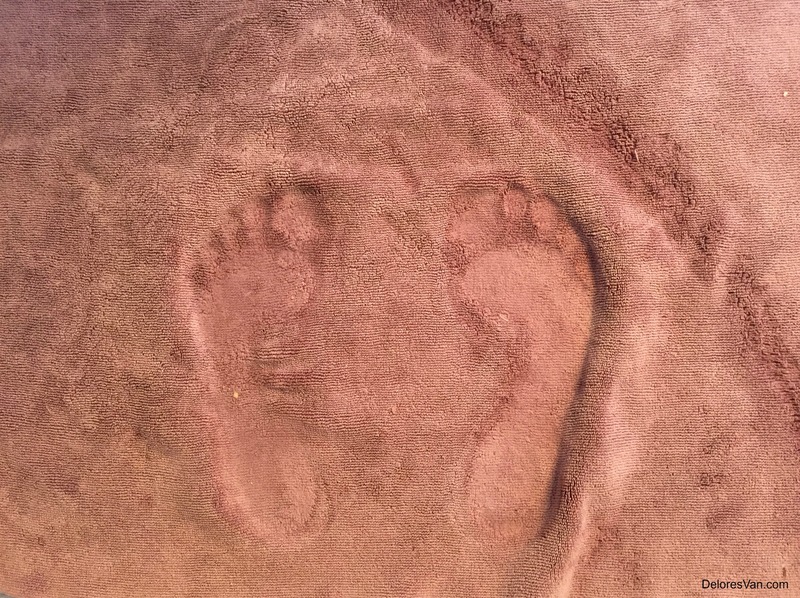 The picture below is of my friend’s lovely feet stepping on a Norwex Bath Mat. She lives by the ocean – lucky girl – and makes good use of her mat. 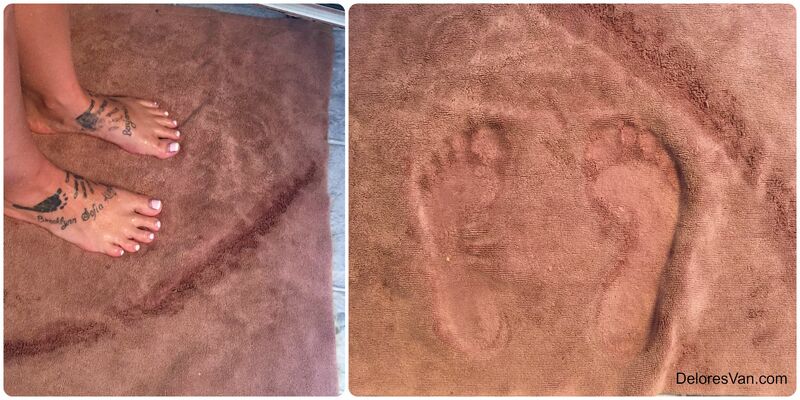 She used the shower head to drench her feet 5 times to be able to make her foot imprint visible. The first 4 times the mat didn’t even look wet. It is that absorbent!!!! Do you have an RV? Did you know that the floor of your RV should not get wet. Wet floors could damage the floor by causing it to lift. Place the Bath Mat on the floor by your shower and every family member will walk out of the RV washroom with dry feet. Have a outdoor swimming pool or hot tub? Put the Bath Mat at your back entrance to catch the drips and dry wet feet before they even enter the house. Do you have a washroom that is regularly visited after using the pool? 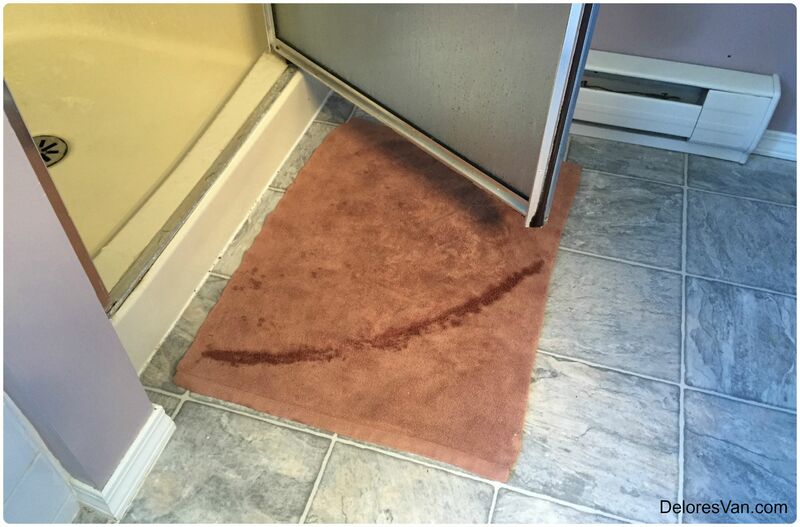 Use the Bath Mat as your toilet mat to catch all the drips while in the washroom. This Bath Mat is a top-seller for pet owners. It has so many uses. The Bath Mat can be used to line the bottom of the crate, not only does it dry your pet’s coat, it absorbs any accidents. Simply throw it in the washing machine, with a cap full Odour Eliminator and some UPP Ultra Plus Power Detergent and it will come out perfectly clean. If your dog comes indoors wet, lay the Bath Mat over their bed for them to lay on. The microfiber will absorb all the wet moisture off their coat, leaving the pet bed dry and clean. I just returned from the Norwex North American Conference in Minneapolis and I am delighted to share that this fabulous bathmat is now available in three colors. Another quick puppy paw trick: Hang a Norwex Dusting Mitt by the door to dry your puppy’s paws and legs when they come in after a long walk. Your hardwood or tiled floors will never be paw-printed again! This post is not for those with a weak stomach, but it is for those with real-life troubles, like throw up in the middle of the night on your carpet and other undesirable areas and a real-life, non-toxic solution from Norwex. Our family was invited to a celebration that went late into the evening. Our youngest daughter had enjoyed many treats which were left out and was encouraged to filled her plate. What 11-year-old doesn’t like great snacks? Unfortunately, later that night at quarter past midnight, Doug and I both heard her in the washroom. In all our 16 years of parenting we had never seen the sight that we were about to find. All three of our girls have been good at either hitting the toilet, or grabbing the throw up bucket located in the hallway closet. Occasionally some vomit would hit the bed, or the carpet, but we had never seen anything like this. This came on way too fast and furious for her to react. As she crawled out of bed it exploded across her room. It hit everything including her bed, carpet, down the mirror, walls and curtains, everything. With a slight break in the heaving, she managed to make it to the washroom. Standing on the edge of the carpet, it struck again. The projectile vomit reached from the edge of bathroom door all to the way to the wall by the toilet paper. Luckily, the majority of it landed on linoleum, but it was pooling everywhere. It was on the baseboards, down the white cabinetry, on the shower curtain, all over the toilet, even running down the walls. A friend of ours who was once a doctor in the pediatric emergency ward told us that since it came on so quickly it was likely food poisoning. It’s short, but explosive! Thankfully her last bout hit the bucket. If you’ve ever been in the same situation you know how we felt. First, it requires all hands on deck! Second, it requires comforting and cleaning up the child. Third, it requires tackling the clean up. For those with weak stomachs, the aroma is sometimes enough to make them want to vomit. After Doug and I assessed the damage, we each picked an area. I was thankful Doug tackled the carpet and I tackled the rest. When things like this happen in my life, I wonder what on earth do people do without Norwex? Our home was converted over 10 years ago and I can’t imagine our lives without it. This is the alternative. When our daughter was in grade one, another kid got sick at school. When our daughter informed the custodian, he came armed with his mop and bucket … but the bucket of smelly water smelled worse than the kid’s vomit. Our family home is a chemical-free zone. Our school is not. Our society has affiliated the smell of chemicals with cleanliness. But chemicals are dangerous for us to inhale because when we inhale, we ingest and absorb the chemicals into our bodies. Vomit is gross, but the tradition chemicals used to clean them up, is toxic. Hence the scull and cross bones. Just because it’s pictured on many household bottles, that shouldn’t alarm us less. So how did we clean up our massive midnight disaster? You may laugh, but I considered taking before and after photos, but reconsidered in order to spare both you and I. Step One: Get a bucket, a large spoon and scoop up the mess. Step Two: Cleaning the linoleum. Grab an EnviroCloth and pour the magical enzyme-based solution Odour Eliminator into a sink of hot water. The worst thing about vomit is the strong stench and slime. This odour eliminator is unbelievable, it works to eliminator the odour as you work to clean the mess. The enzymes imediately go to work to totally get rid of the odour that fills the room. If you are the one who is sick, you’ll especially appreciate scent of the Odour Eliminator, as the smell of the vomit alone can make you throw up again. 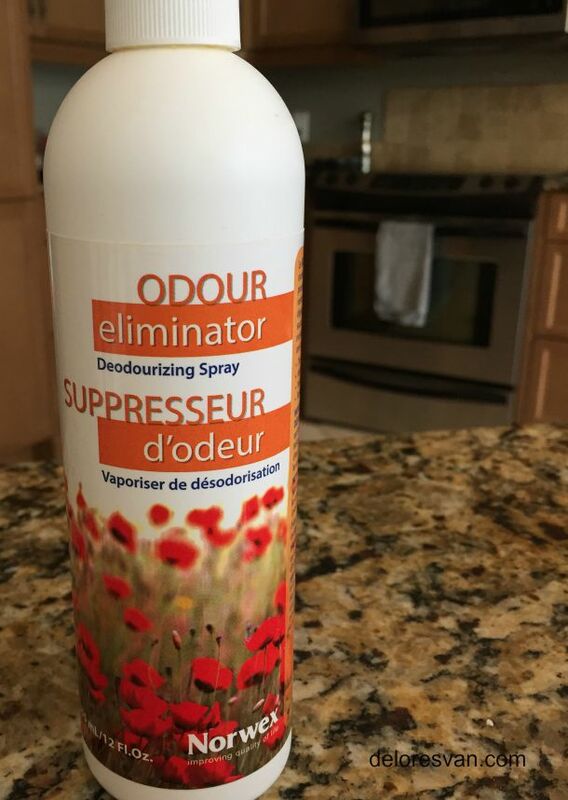 Tip: Use the Odour Eliminator as a air freshener by diluting with water in a water spray bottle (1:7). This is a chemical-free replacement for aerosol and spray bathroom fresheners. Step Three: Launder the bedding, blankets and stuffed animals. Use Norwex Ultra Plus Power (UPP) Laundry Detergent and a cap full of Odour Eliminator. The enzymes of the Odour Eliminator together with the UPP Laundry Detergent will work to get your linens fresh again. There is no need for chemical-laden-scented fabric softeners to freshen the laundry. Step Four: Cleaning the carpet. Our carpet is ivory and therefore we have a handy little carpet cleaner. Put a cap full of Norwex’s UPP Laundry Detergent into your machine. Once you have gone over the surface, grab your Norwex enzyme-based Carpet Stain Buster. This is an amazing product. It is not designed to give you instant results. It is an enzyme, it works over time giving you long-term effective results. After the mess is cleaned up and you are left with the stuborn stain, mist the Carpet Stain Buster over the affected areas and walk away. Let it sit on the surface and the live enzymes will be activated by the organic matter and will remove the stains in the upcoming hours. Done! Read this testimony from a Norwex customer.